JUSTICE FOR ALL VICTIMS OF EXTRAJUDICIAL KILLINGS AND STATE VIOLENCE UNDER THE DUTERTE REGIME! BAYAN USA condemns the cold-blooded murder of Randy Felix Malayao, 49 years old, one of the youngest peace consultants of the National Democratic Front of the Philippines (NDFP), a multi-sectoral revolutionary alliance. On January 30th, Malayao was taking the bus in Aritao, Nueva Vizcaya on his way home around 2:00am when a gunman slipped into the bus and shot him twice while he was sleeping. Malayao is one of over 170 victims of politically motivated, state-sponsored extrajudicial killings as Duterte continues his rampage and counter-insurgency campaign against critics and human rights groups. 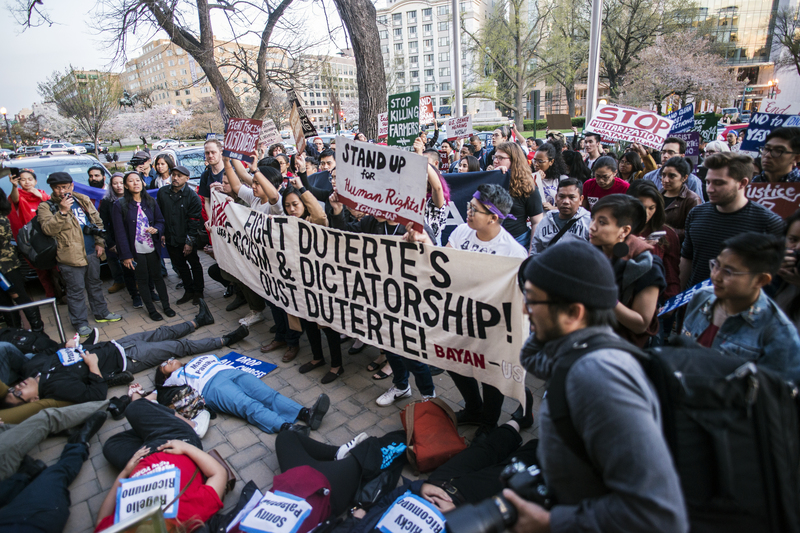 “The Duterte regime continues to sabotage any chance of peace by assassinating Malayao, NDFP consultants, and other human rights defenders whose life’s work is to serve the interests of the poor and oppressed,” BAYAN-USA Chairperson Rhonda Ramiro said. In 2008, Malayao became a political prisoner and faced heavy torture under then President Gloria Macapagal-Arroyo, and trumped up charges were dropped only after suffering four years of unjust imprisonment. Malayao was widely-known as a human rights defender and served as the regional coordinator of progressive BAYAN MUNA partylist, and as a a spokesperson and representative of the NDFP during peace negotiations with the Government of the Republic of the Philippines (GRP) in Oslo, Norway. As an official NDFP peace consultant, Malayao was supposed to be guaranteed safety under the Joint Agreement on Safety and Immunity Guarantee (JASIG). Last year, Duterte cancelled the peace talks right before the next agenda item was to tackle much needed socio-economic reforms, in which the NDFP was to present their Comprehensive Agreement on Socio-Economic Reforms (CASER). “Duterte employs state-sponsored terrorism against the people. He utilizes the drug war, martial law, and counter-insurgency programs as a desperate attempt to dodge responsibility for the failing economy, the skyrocketing costs of living, widespread poverty, increasing displacement of indigenous people, and civil unrest,” said Ramiro. While Duterte places crosshair targets on the backs of human rights defenders, the people are left with no choice but to fight back and grow the movement to oppose this fascist dictatorship. He has endangered the lives of poor peasants, workers, women, bishops, journalists, teachers, students, indigenous people, and more. We demand justice and accountability for the murder of Randy Malayao. 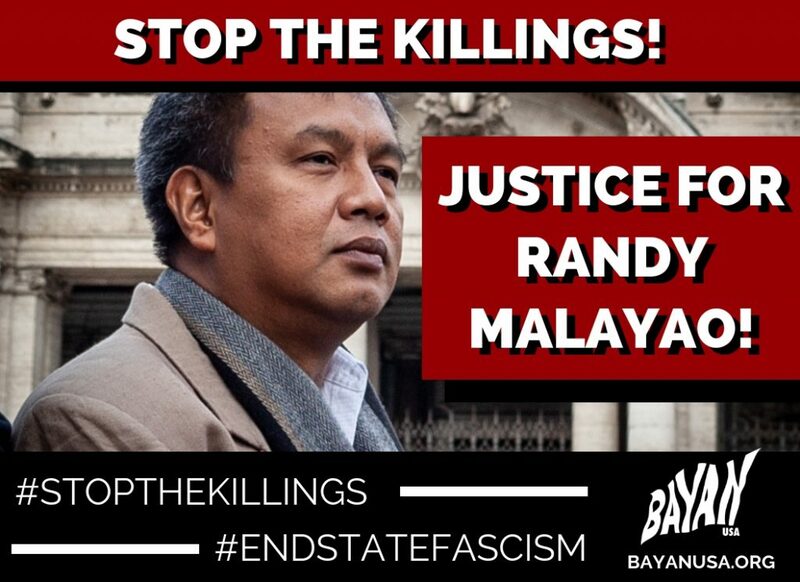 We call on member organizations of BAYAN-USA to launch actions and mobilizations to hold the Philippine government accountable for the murder of Randy Malayao and to demand an end to US support for the fascist Duterte regime’s continuous killing spree.